spw053580 SCOTLAND (1937) [Unlocated]. Unlocated townscape, possibly in Glasgow. An oblique aerial photograph. This image has been produced from a print. Title [SPW053580] Unlocated townscape, possibly in Glasgow. An oblique aerial photograph. This image has been produced from a print. Cathkin Bakery One time home of Nairn's Oatcakes and Shortbread. Rutherglen, Glasgow looking south (and slightly east). 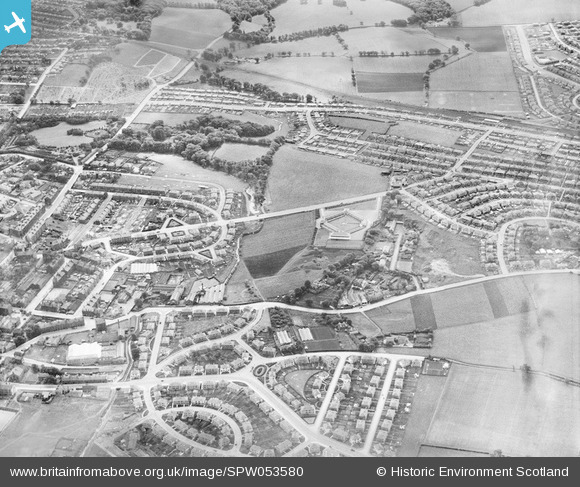 Croftfoot Road at the top of the photograph; Pinkerton Avenue and Gilmore Crescent in the foreground.